Private pool with unique shape and lazy river. The bottom pool is about 2500 sq. ft. with a lazy river, an island, grotto and large rock walls for diving. The unique shape and soil conditions for this pool required a grid of grade beams to control differential movement, which could lead to cracks and leaks. 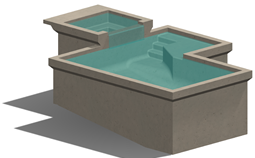 They were also designed for buoyancy based on the upset condition of water to grade with the pools being empty. 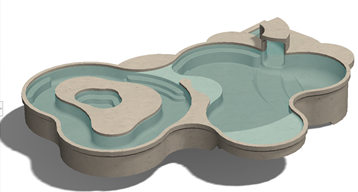 Clark Engineers has designed a number of pools for both public and residential clients. Community Pool design supported by drilled piers based on recommendations from the soils report. Small pool next to house and close to bulkhead. Supported on helical piles.